An overweight man in Los Angeles says he was "beyond shocked" to discover an altered photo of him on New York City billboards with his leg removed. 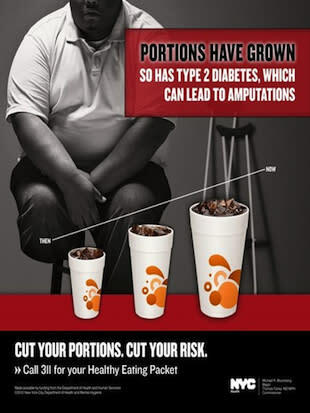 The stock photo was then sold to New York City's Department of Health, who digitally altered the photo to remove Berry's right leg and is using the photo as part of an anti-diabetes campaign. "I cried at my computer screen for, like, a minute." Berry said of first seeing the altered photo. "I said: 'Oh my gosh, they even gave me crutches. Come on, people.' "
The health department said it's common practice to alter photos without the model's participation. And Berry agrees he signed a waiver before the shoot, allowing for such alterations and distribution. "This issue isn't about one actor but rather the 700,000 New Yorkers who struggle with diabetes, which kills 1,700 people a year and causes amputations in another 3,000," said John Kelly, a spokesman for the health department, in a statement. "Advertising to warn the public about health concerns saves lives, and we will continue our efforts to warn New Yorkers about diabetes." Berry said his main objection over the advertisement is how it could affect his acting career. "I've always wanted my photo in an ad all over the city, but I was hoping it would be for a TV show or something, not — this," Berry said. And he's even willing to seek professional revenge, offering to lower his usual acting rate to any soda companies who might want to use his unaltered image in one of their campaigns. "I'll sing and dance for them and I won't charge an arm and a leg," he said.